Some risks and the plans for managing them are personnel-sensitive in the sense that disclosure can harm the enterprise or its people. Since most risk management plans are available to a broad internal audience, personnel-sensitive risks cannot be managed in the customary way. Why not? 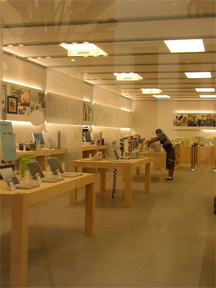 The interior of an Apple store, location unknown. Because shares of Apple (common) were among 2010's high flyers, there has been demand for the reports of analysts who follow the company. These analysts don't rely solely on the pronounce­ments of the companies they follow. They try to learn whatever they can about what the future holds using a variety of techniques, one of which is called a "channel check." In a channel check, an analyst interviews people at companies in the target's supply chain, to determine the future pace of business for the target company. See Susan Pulliam's report, "Supply Data Now a Focus of Probe," in the Wall Street Journal of November 24, 2010. Although the present essay focuses on the impact of risk management plans on the privacy concerns of individuals (and vice versa), risk management plans also raise issues for projects analogous to the issues for companies raised by the channel check. For instance, the content of a risk management plan might be of some value to a political rival of the project's sponsor, especially if that rival plans to rely on some of the same people as the project does. Even though the project isn't especially sensitive in the proprietary sense, the enterprise-public status of its risk management plan could make the project vulnerable to the actions of the sponsor's rivals. Photo by Hersch courtesy Wikimedia. Personnel-sensitive risks are those that can be understood only after acquiring personnel-sensitive information — information that, if disclosed improperly, could compromise the privacy of an employee, and thus the enterprise or its security, or place the enterprise in legal jeopardy. Most enterprises are reasonably careful about these disclosures, but protecting employees' privacy can become problematic for risk management planning. Risk management plans for typical projects are usually enterprise-public. That is, anyone with a reasonable business-related need to examine them can do so — sponsors, project managers, auditors, functional managers and many others. Even when the author's permission is required, the security protecting risk management plans is rarely any more robust than the security protecting their projects. That creates problems. Suppose that Dan's elderly mother has been gravely ill. Because he's been shuttling back and forth to his hometown for six months, his availability has been unpredictable, and certainly less than 75%, but her death is expected mercifully soon. Dan's project manager wants to revise the risk plan to take this into account, justifying a reduction in reserves previously allocated to covering for Dan. In many organizations, there is no way to do this transparently without compromising Dan's privacy. This example probably lies at the innocuous end of the spectrum of personnel-sensitive risks. There are others far more sensitive — divorce, illness or injury physical or mental, disciplinary issues, substance abuse problems, office love affairs gone wrong, and toxic conflicts, to list just a few. The inability to plan discretely for managing personnel-sensitive risks has important consequences. You can't document mitigation plans for risks you can't discuss. Since risk managers can't safely discuss certain risks, they either fail to mitigate them adequately, or they conceal the mitigation elsewhere in the mitigations of risks they can discuss. were actually doingfrom past experience is difficult when the risk plans as documented differ from what the risk managers were actually doing. Risk managers who do try to plan transparently are at risk of disclosing personal information that should not be disclosed. Such action could potentially create legal liability for the enterprise or for the discloser. Knowing that personal information is at risk of disclosure, some employees keep personal information private, even when they know that doing so might harm the task for which they are responsible. The risks that enterprise-public risk management plans cannot address are therefore rarely subjected to the best available risk management practices. These risks persist unmitigated, or at best, they're mitigated by informal, off-the-books decisions and allocations. Enterprise-public risk management plans are simply inadequate to the task. Would you like to see your comments posted here? rbrenesICWKtOmudDElNpner@ChacZZJbderVuXjByLOAoCanyon.comSend me your comments by email, or by Web form. Some practitioners of workplace politics use an assortment of devious tactics to accomplish their ends. Since most of us operate in a fairly straightforward manner, the devious among us gain unfair advantage. Here are some of their techniques, and some suggestions for effective responses. See also Ethics at Work and Project Management for more related articles. I offer email and telephone coaching at both corporate and individual rates. Contact Rick for details at rbrenvIrcdfUPlNqmLsmoner@ChacBjuevutUfxZdYKSmoCanyon.com or (650) 787-6475, or toll-free in the continental US at (866) 378-5470.